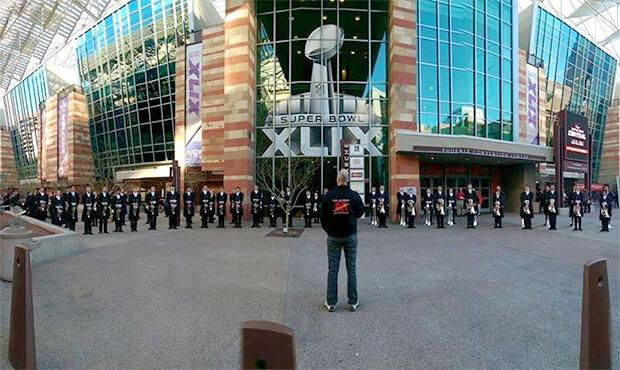 The Academy sets up to perform outside the Phoenix Convention Center to mark the opening of the NFL Experience. Super Bowl fever is gripping the state of Arizona this week, and the Academy is fired up to add its own entertainment to the week-long party that's taking place in its own backyard. The arts organization from Tempe, Arizona, will have a group of brass, percussion and color guard members performing at various events leading up to and on game day when Super Bowl XLIX comes to University of Phoenix Stadium on Sunday, February 1. The ensemble is made up of more than 100 members and is bigger than Academy Executive Director Mark Richardson originally envisioned when his organization was asked to get involved with Super Bowl festivities. Richardson explained that with a requirement to submit a personnel roster for credentials and security clearance even before his drum corps had finished its auditions, it allowed the Academy to expand this experience to more than just its 2015 members. "We decided to open the opportunity up to not only corps members who marched last year, but also to students of our youth guard programs, first-time applicants for 2015 and alumni," Richardson said. "What we've ended up with is a group of about 50 percent alumni and 50 percent current program members." The Academy has a number of events on its performance schedule this week. This past Sunday, the group performed outside of University of Phoenix Stadium in Glendale before the start of the NFL Pro Bowl. 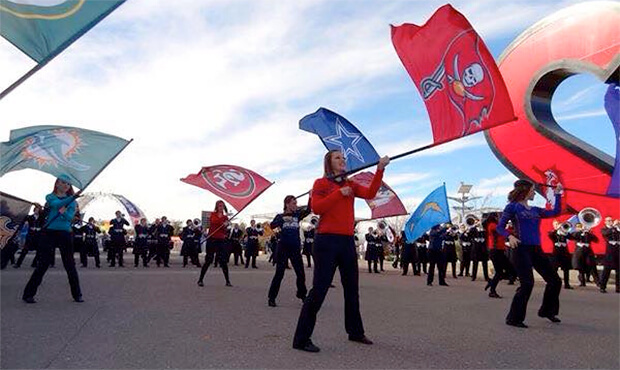 Prior to Sunday's Super Bowl, the corps members can be seen in and around the Phoenix Convention Center for the NFL Experience, which is an interactive "theme park" of all things football, featuring games, displays and other entertainment and attractions. On game day, the drum corps will head back to Glendale before the kickoff between the New England Patriots and Seattle Seahawks to play at tailgate parties and other stops just outside the stadium. The Academy performs outside of University of Phoenix Stadium as part of last Sunday's NFL Pro Bowl. Ensemble members will wear the corps' familiar black and silver uniforms with color guard members clad in NFL apparel with flags depicting team logos. They've learned a selection of college halftime-like music for these events. Richardson says that getting the group ready to perform has come with its own special challenges. He explained that with just three in-person rehearsals to prepare in December and January, staff members sent music out electronically so corps members could learn and practice on their own, while choreography for the color guard was recorded and shared online. Uniforms and costumes had to be fit and tailored and color guard flags printed. "Our staff, sponsors and volunteers came to the aid and have truly knocked it out of the park for us," Richardson said. With game day on the horizon, the Academy is not only excited to represent its home state, but also to represent Drum Corps International on one of the professional sporting world's biggest stages. "It's an incredible opportunity for us to showcase the quality music education and performing arts opportunities that are here in our home state," Richardson said. "It's also important to us that we're able to point the spotlight on the drum and bugle corps activity to a huge audience who may not otherwise ever be exposed to it." Follow the Academy's Super Bowl performances on Facebook.